In eighth grade Brian Losh '67 prepared for his entrance exam to Bishop Blanchet High School, expecting to follow in the footsteps of his older brothers and sister. "There was no back-up plan in those days," he says. "You applied to one school, and if it didn't work out, you went to public school. The night before the test my Mom told me there was a change of plans and that I would be taking the Prep test instead. I didn't even know where Prep was!" This "game changer," as Brian refers to the turn of events, was influenced largely by a growing friendship between Brian's mother and a Jesuit priest, Fr. Bill LeRoux, S.J. Brian says, "Fr. LeRoux got me into Prep, but Fr. Tom Williams, S.J. allowed me to stay." Brian is fascinated by the qualities of his fellow Prep alum-their exceptional abilities to write, speak, think and discern. Brian praises classmate Fr. Phil Boroughs '67, S.J. for his talented communication skills as President of the College of the Holy Cross. 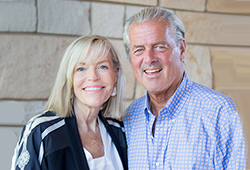 Brian and wife Betsy Terry Losh also employ over 10 Prep alumni. "We didn't seek them out," points out Betsy, "it just happened. We know they're smart, well-trained and have an incredible work ethic and sense of loyalty. They are committed to the organization. You won't find that in every high school graduate, but Prep fostered it." This gratitude for Jesuit education is one reason why Brian and wife Betsy have included Prep in their estate. The Jesuit legacy is another. The Jesuits played a pivotal role in the Losh and Terry families. Brian was baptized at the Jesuit-run St. Joseph Parish on Capitol Hill and Betsy was baptized by her uncle, Fr. George Purdy S.J. at Immaculate Conception (formerly a Jesuit-run parish). The ties to Prep are deep as well. Betsy's father, John "Jack" Terry is a 1939 grad, as well as their two children, Andrea Hackman '93 and Casey Losh '91. Fr. Paul Fitterer, SJ also married Casey and baptized several Losh grandchildren. 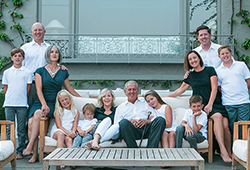 The Losh's connection to the Catholic community has been enhanced by their relationships in the Jesuit community. "The Jesuits were teachers and mentors, at Prep and in life. Jesuits like Fr. Fitterer were an integral part of many families' lives," says Brian. "All roads lead to Prep," says Betsy. "Prep is a thread that carries through families. The McHughs. The Mullallys. Jesuit education is generational." The Jesuit connection is still a constant part of Brian's life. "Not a day goes by when I don't talk to, or do business with, someone connected to Prep. I run into Jesuit-educated folks all over the world. The other day I had dinner with Lou Piniella; it turns out he went to Tampa Prep! Just like my wife Betsy, a Forest Ridge alum, and her Sacred Heart friends, you can tell when people are Jesuit-educated." For Brian and Betsy, their decision to include Prep in their estate is simple. "Prep's been here for 125 years and it will be here for another 125. Through our gift, we are building a legacy. That's exciting!" says Betsy. "We're hopeful that our six grandchildren will come here, and maybe even our great-grandchildren." Brian says giving is contagious. "We give to help those less fortunate; those who might not have the ability to attend Prep without help, but could benefit greatly (from a Jesuit education). It's good for our family (to know) that we think highly enough of an institution to do this." "I just read about a 31-year-old Prep graduate, Max Helman '04, who donated to Christ the King School to help kids with tuition. I find that inspiring!"